As the baby boomers reach retirement age, one would think more doctors would be specializing in caring for seniors. In fact, the opposite is true: There’s now a shortage of geriatricians — doctors who focus on treating seniors — and experts say the problem is projected to only get worse. There is just one geriatrician for every 2,600 people 75 or older, according to the American Geriatrics Society — compared to one pediatrician for every 1,300 children. What’s more, that ratio is expected to grow to one geriatrician to ever 3,800 seniors by 2030, the society projects. One of the reasons for this shortage is that “a career focused on caring for older adults can be particularly financially unattractive for physicians with increasingly large medical school loan debts,” says Jillian Lubarsky, a spokesperson for the society. That’s because Medicare reimbursement rates are often lower than regular insurance rates, which means that geriatricians sometimes get paid less, she says. While not every senior needs a geriatrician, these doctors receive specific training in aging-related diseases, so they’re often a sought out when patients wrestle with illnesses like dementia and arthritis, which disproportionately affect older adults. 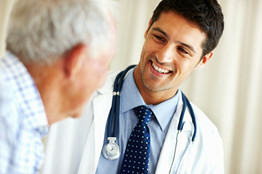 These doctors also have background in helping older individuals who face multiple illnesses. The shortage of geriatricians will “without question” lead to worse health care for some seniors, says Marc Agronin, the medical director for mental health and clinical research at Miami Jewish Health Systems. The average older senior is on multiple medications, and while a general family doctor might not know specifics on how all these medications interact, a geriatrician would, he says. Other medications have side effects that may be particularly harmful to older people — though, again, the average doctor might not realize this. And “treatment goals for people in their 70s vs. people in their 90s can be very different,” Agronin says. Bottom line: “When you have a skin problem, you open want to see a dermatologist because they’ll have specialized knowledge,” he says. “When you’re older, you often want to see a geriatrician for the same reason.” So, if there are simply not enough of these doctors, seniors may face worse health outcomes. To help reduce the geriatrician shortage, the American Geriatric Society is working to advance loan forgiveness for those in the geriatrics field, as well as to reform payment practices that currently are sometimes unfavorable to geriatricians.